I am so excited to get to share with you another one of those "secret finises". I actually finished this quilt back in September of 2014, so it is so fun to finally get to share it. So . . .here is Argyle Socks!! Argyle Socks is featured in the Summer 2015 edition of Fons and Porter's Easy Quilts. And it really does go together super easy using strip piecing and some quick bordered blocks. And I bet you can guess what inspired the design. Yup, my husband's Argyle Socks. I love the wonderful motion this design creates and the mixture of the white and brown background playing off the bright colors from Denyse Schmidt's Hadley line, really makes it pop!!! Then in the background squares, I did some back and forth lines in opposite directions to really make it pop and then some ribbon candy in the borders. I really had so much fun quilting this one up. You make the most amazing designs, and you have a GREAT eye for color! Love this! Great design and wonderful use of fabrics. Loving this one. Would be good for some of those larger print fabrics I have a hard time using. Oh! Argyle Socks is so striking - I love it Melissa! And Congratulations on another great published design! This is so cute and I can't wait to make my own version! Gorgeous. This looks like a fun quilt to make. I'll have to add it to my list and keep my eye out for the magazine! I absolutely love argyle socks - and they can be so difficult to find for girls! I can see making this in colors of one of my favorite pairs - cream, pink, and brown! Just beautiful! Wow!! Thats beautiful! You churn out so many beautiful quilts! I love it so much! The colors, the argyle pattern, just awesome!! Congrats! on another great design!! What perfect timing! I've been playing with my Hadley bundle for the last two days. Opened your blog tonight and there was my answer! Downloaded it immediately!! Thanks! 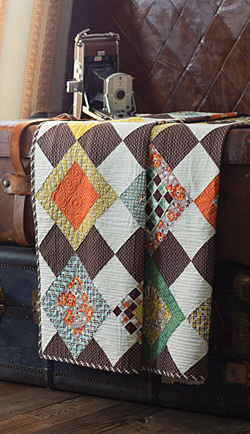 Love the quilt and the binding sets it off just right! I stopped by your blog today. Love the quilt. I love the colors - making me think of fall and it's only July! Oh that is such a cute idea. Love it. Wow, an eye candy, absolutely beautiful!